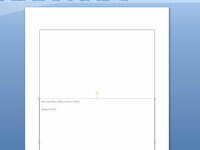 Create a duplicate slide immediately following the slide that requires two pages of notes. To duplicate the slide, move to the slide that you want to duplicate in Normal View and press Ctrl+D to duplicate the slide. 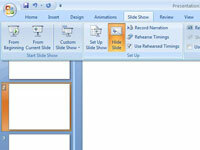 Click the Notes Page button in the Presentation Views group of the View tab. 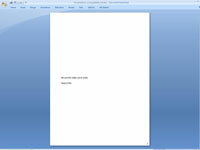 The notes page for the new duplicate slide appears. Delete the slide object at the top of the duplicate notes page. 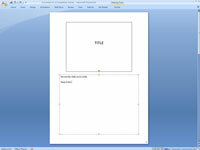 Click the slide object at the top of the page and press Delete. Extend the notes text area up so that it fills the page. Drag the top-center love handle of the notes text area up. Type the additional notes for the preceding slide on this new notes page. 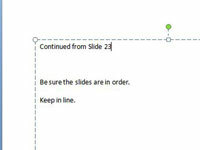 Add a heading, such as Continued from slide 23, at the top of the slide. 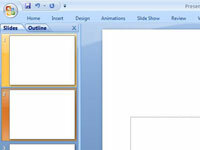 Click the Normal button in the Presentation Views group of the View tab. You return to Normal View. 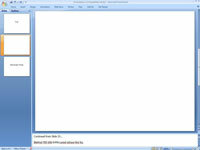 Open the Slide Show tab on the Ribbon and then click the Hide Slide button in the Set Up group. The Hide Slide button hides the slide, which means that it isn’t included in an on-screen slide show. If you’re printing overhead transparencies, deselect the Print Hidden Slides check box in the Print dialog box. This way, the hidden slide isn’t printed. Be sure to select the check box when you print the notes pages, though.